Ground Beef…It’s one of the most popular ways in which beef is consumed. It’s versatile and can be simply made into burgers for the grill or into a fancy Bolognese sauce for pasta. There are literally thousands of different recipes for ground beef. Some of the most popular include: meatloaf, chili, meatballs, tacos, and of course, the iconic American burger!! 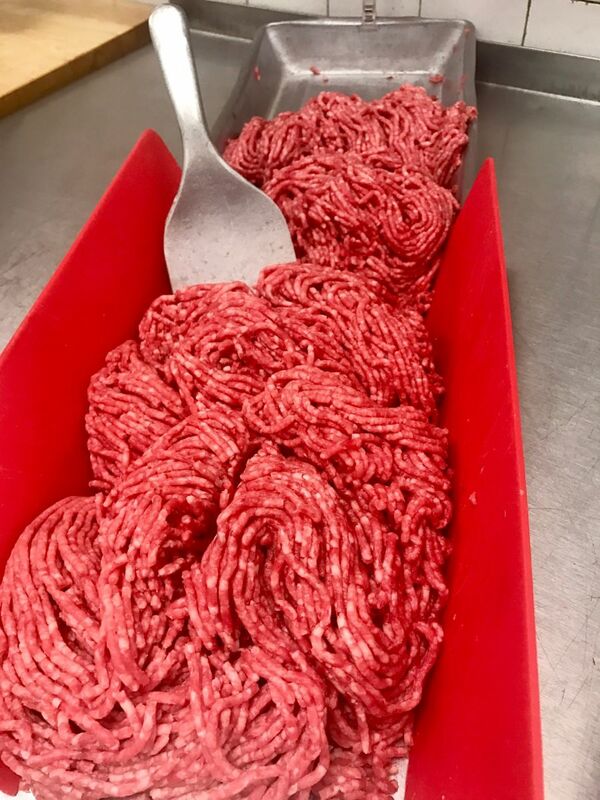 Ground beef is made out of “trimmings,” which are pieces of beef that are trimmed off a primal cut to make the slice of beef look more desirable in the meat counter. Trimmings may include whole muscle meat, which are boneless without cartilage or heavy connective tissue. 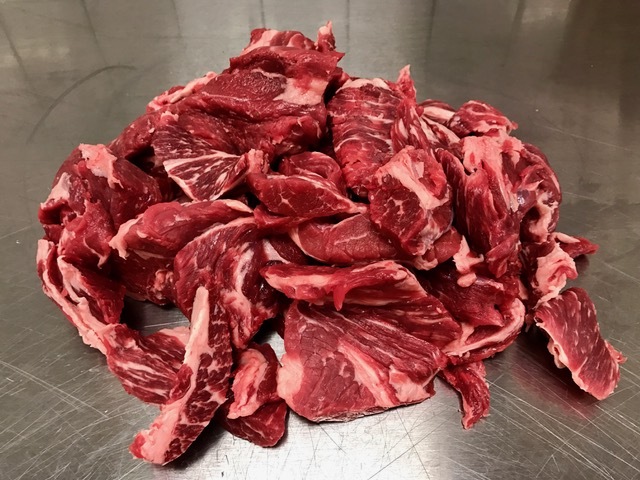 An entire beef carcass will yield about 15-20% of its weight in trimmings. 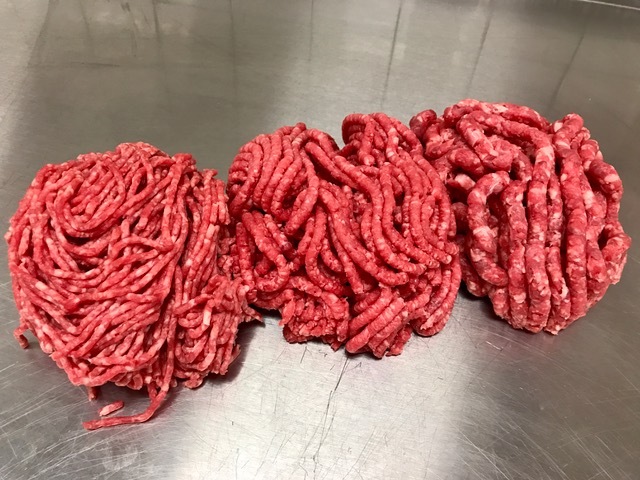 At my shop we grind three different types of ground beef: 80% lean ground chuck, 85% lean ground round, and 90% lean ground sirloin. Each type is made of trimmings from that specific primal cut. 80% lean ground chuck (shoulder) will be the juiciest and most flavorful. It’s also the grind I recommend for making burgers for the grill. It has the perfect fat-to-meat ratio. These burgers will still be juicy when grilled to the recommended internal temperature of 160 degrees. 85% lean ground (rear leg) will have less fat and flavor. 90% lean ground sirloin (just in front of the rear leg) will have very little fat and is preferred by those who are watching their fat intake. Sirloin is best in recipes that may include spices to bring out the flavor. Sirloin may be drier and may not have as soft of a texture. 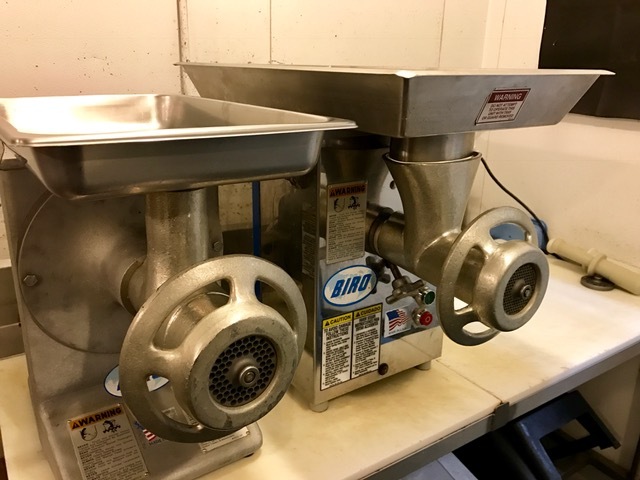 Ground beef is made with different sized plates on the meat grinder. It may be fine, medium, or coarse. Fine is the most popular and commonly found in grocery stores and butcher shops. 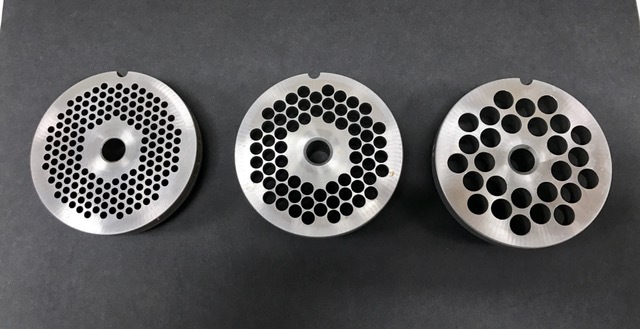 We use it everyday in our production of grinds for the meat case and is perfect for most recipes. Medium size will have a meatier texture, while holding in more moisture. This is definitely my grind choice for burgers!! Coarse ground is best for recipes like chili. The meat will not break down as much as a fine grind, therefore producing a moist, chunky texture. With all sizes of grinds it’s best to grind the meat through twice for a consistent product. When buying ground beef, I recommend having your butcher grind something on the spot for you. Let him or her know what you’re making, how lean you want it, and go with their recommendation! Sometimes you won’t be able to track down the butcher, and you’ll have to choose your ground beef from the self-serve meat case. Look for something that was freshly ground today in store. Make sure to check the sell-by date. Ground beef should have a bright pink-red color with visible flecks of meat and fat in it. Avoid ground beef which looks pale or pasty; it was probably ground too many times. Ground beef is the most perishable item in the meat case, and thus has the shortest shelf life. When you get your ground beef home, store it immediately in the fridge that is below 40 degrees. Use it the same day, or freeze it for a later day, up to 3-4 months. Share pictures of your favorite ground beef recipe with us on Facebook, Instagram and Twitter. Use #WeberGrills and Grill On!!! !